Assembling garage and storage cabinets has never been easier! The Slide-Lok garage storage solution features a patented Dovetail assembly system to make assembling your garage cabinets quick and easy! All cabinet components slide together without force or effort because of Slide-Lok's patented Dovetail assembly system. 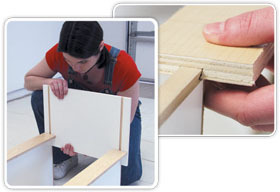 Assembling your Slide-Lok garage cabinets is quick and easy. Your local Authorized Slide-Lok Dealer will be happy to assist you with installation of your Slide-Lok garage storage solution. Click here to locate your local Slide-Lok Garage Interiors & Storage Cabinets dealer. If you should decide to assemble your Slide-Lok Garage Cabinets yourself, each Slide-Lok storage solution comes with the hardware needed for assembly and installation and is accompanied by detailed assembly instructions. The Slide-Lok garage storage solution is easy to assemble and install because of our patented dovetail assembly system, truly DIY friendly garage cabinets. All components slide together without force or effort. Be sure to measure the space you plan on installing your Slide-Lok Modular Garage Storage Cabinets in. If you are not sure if your garage cabinets will fit, or would like an estimate on a custom Slide-Lok garage cabinet configuration, please contact us today!